23 October 2006: Makati Mayor Jejomar Binay has shot to prominence as one of the most divisive yet popular figures in Philippine politics, possibly the embodiment of a city leader who can inspire the masses and irk the national political establishment. As well as a hard-earned reputation for sound city management, he can point to a leading role in restoring democracy to the Philippines after two decades of dictatorship. The Mayor came fourth in World Mayor 2006. Update July 2010: In June 2010 Binay was inaugurated as Vice President of the Philippines under President Noynoy Aquino following his successful election to the post and stood down as Makati mayor. He narrowly missed being appointed Secretary of the Interior and Local Government in the administration, the post instead going to Naga City mayor Jesse Robredo. The hardworking mayor has seen off numerous crises, attacks and even term limits during his almost 20 year stint since taking charge of Manila's financial district. As with all awkward yet popular city leaders, he is frequently spoken of as a possible candidate for the presidency. Makati, as well as serving as the country's financial hub, is also home to an array of top class hotels, shopping malls, skyscrapers and country clubs, rendering it something of a byword for opulence among those familiar with Filipino society. In 2004 Makati was ranked by the Asian Institute of Management as the Most Dynamic City and a year later as one of the Top 5 Most Competitive. Binay's jurisdiction may cover the Manhattan-style skyline of the Filipino banking district but his origins are substantially more humble, born into quasi-poverty and orphaned early on, his first job was tending his uncle's pigs. Continuing to support himself through school, he managed to obtain a place at the University of the Philippines to study political science and then law, before being called to the bar a few years later. Binay graduated and spent the next few years practising community law among the city's poor, this being the era in which the post-independence Philippines was subject to considerable internal tension (student unrest and Communist insurgency) and external intervention (CIA meddling), with the US-backed Ferdinand Marcos beginning his tenure as president and de facto dictator for the next two decades. It was during this period that Binay was imprisoned following the introduction of marshal law and state action against pro-democracy campaigners. Binay the lawyer remained committed to his human rights work and campaigning for the reintroduction of popular democracy against the kleptocratic and increasingly draconian Marcos regime (the so-called 'New Society' of constitutional authoritarianism). With the resumption of popular rule following the ESDA revolution of 1986, Binay was installed as the officer in charge of the City of Makati under the transitional government of Cory Aquino, before securing three more terms as mayor, the only impediment to a fourth term coming in the form of term limits in 1998 (where his wife temporarily replaced him). It is his stewardship of the city he found in near-bankruptcy that his earned him his reputation as a financially sound innovator in city governance, emerging as the most prominent mayor in the Philippines during this period as a result. Since overcoming the budget deficits he inherited on becoming mayor, as well as overseeing the upgrading of the city to a higher tier authority, Binay has transformed Makati into the country's leading municipality for e-governance, heralding the council's work towards paper-less transactions. However, success can also provoke jealousy and begat enemies and Binay is certainly not short of these, as recent events have shown. Binay's popular touch with the city's poor and light touch approach to the business sector that has seen him traverse the communal divide in the highly polarised community may also contribute to this. The city is indeed notable for the pass porting of funds to finance special education and healthcare programmes for its poorest inhabitants. Furthermore, Binay belongs to the Philippine Democratic Party-National Struggle, which played a leading role in campaigning for the restoration of democracy in 1986 but is now regarded as small yet influential opposition party. As ever, politics in the Philippines are in flux. The beleaguered and scandal-hit administration of President Arroyo (which has also faced a coup attempt this year) has been accused of seeking to remove unsympathetic mayors in the run-up to the May 2007 congressional and municipal elections. In addition to banning all 'unauthorised' demonstrations under a presidential decree, in October 2006 the Department of Interior and Local Government issued a suspension from office for Binay and several senior officials following an accusation of false accounting at city hall, a charge resisted by Binay, who secured a 60-day appeal against the order in the courts. Binay and his family, as well as hundreds of supporters, holed themselves up in his city hall office in anticipation of forced removal and possible arrest and even the country's military were warned to remain impartial in the dispute (Binay is also a marines colonel in the reservist forces). Following the court's revocation of the government's order, thousands of supporters took to the streets of Manila to demonstrate their approval of the mayor, who is also backed by former presidents Aquino and Estrada, though the Arroyo administration remain determined that Binay will be suspended from office as part of its efforts to eradicate local corruption. While Binay can rightly point to an inspiring track record as both a campaigner for democracy and a champion of the city's poor, there are those who claim the mayor operates as an autocrat and hides behind his populist rhetoric to disguise his machine-like grip on the city's politics, as evidenced by his virtually uninterrupted two decades in office (the only interregnum coming in the form of his wife during a term limited stint out of office). His supporters' grip on the most routine and minor aspects of daily life in the city and his continuing friendship with the deposed ex-president and fellow populist Joseph Estrada, currently awaiting trial for corruption, act as black marks for those critical of his administration. Besides being a member of the Rotary Club of Makati, he is currently on his third term as the National President of the Boy Scouts of the Philippines. He also holds positions in international organisations, namely: Vice President for Membership (2006- 2008), United Cities and Local Governments-Asia Pacific Chapter; Life Honorary Member (since February 2001) and Member, World Executive Committee of the International Union of Local Authorities-Asia Pacific; Member, Executive Committee (2006-2009), Network for Local Authorities for the Management of Human Settlement (CITYNET); and Chairman, Finance Sub-Committee, World Scout Organization. 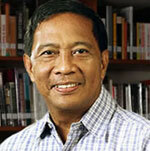 Mayor Binay was also a senior executive fellow of the John F. Kennedy School of Government at Harvard University. He is married to Dr Elenita Binay, a medical practitioner and herself the former mayor of Makati (1998-2001). They have five children. Makati City is one of the most important cities in the Philippines in terms of finance and commerce. Situated east of the capital, Manila, Makati is one of the cities and municipalities that comprise Metro Manilathe National Capital Region. Makati is often referred to as the Financial Capital of the Philippines since many companies have their offices and headquarters in the city. 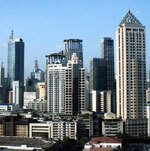 Makati is also home to the influential Makati Business Club and the Philippine Stock Exchange. Ayala Avenue, running through the heart of the Central Business District is often called the Wall Street of the Philippines. Makati is noted for its highly cosmopolitan culture. Many expatriates live and work in the city. Makati is also home to many first-class shopping malls such as Ayala Center and Rockwell Center. The city also has many of the country's five-star hotels like The Peninsula Manila, the Mandarin Oriental, the Shangri-la Makati Hotel, New World Rennaisance Hotel, Intercontinental Hotel Manila, and Dusit Hotel Nikko. Makati came from the Tagalog word kati, which means tide. This primarily refers to the rise and ebb of the tide of the Pasig River on the city's northern border. The river drains into Manila Bay to the west. and it was also known as San Pedro Macati during the Spanish era.